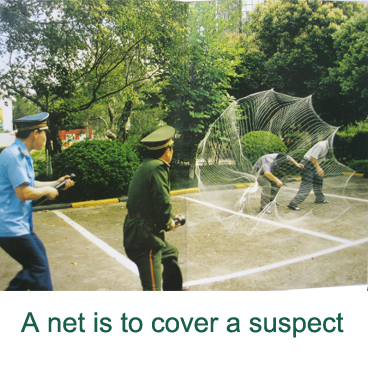 The NET-2000 Shooting Net Rod looks like an ordinary flashlight. But watch out, evil-doers. Here comes the Spiderman! The NET-2000 Shooting Net Rod uses a charge of highly compressed air to fire a 52 square foot net of high-strength Nylon fiber at your foe. Capture suspects up to 49 feet away. Before you play the NET-2000 Shooting Net Rod video, be sure to follow these instructions. First, click on the comments link to open the comments page in another tab or window. Find the video that shows the opening to the original Spiderman television cartoon series. Make sure sound is on, then start the cartoon video. This will provide the correct audio, which should have been provided on the video of the NET-2000 Shooting Net Rod below. Once you have the sound started, return to this window or tab, and start the NET-2000 Shooting Net Rod video with its sound off. Now, you've got picture and sound! Amazing. Now, they need to sell them to kids forty years ago, because I'd certainly have one, along with my AirBlaster. Via Web Gun Turns You Into Spider Man; thanks to Moira for the tip and references.